This is our most popular style, and it's the pan you'll find in the majority of households in Spain. 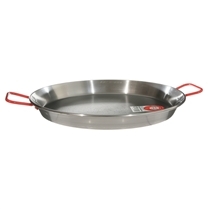 It's ideal for paella because carbon steel conducts heat quickly and evenly. The steel is thin but quite rigid and durable, and the smaller sizes have a hammered dimpled bottom to help with rigidity. Some paella aficionados feel that carbon steel makes a better tasting paella. Carbon steel requires a bit of care: you must dry the pan right after washing it and then rub the inside with a little vegetable oil to prevent rusting. If the pan does rust, a few passes with steel wool takes it right off. To see pans on sale, scroll down below the chart. 26" Carbon Steel Paella Pan (65 cm) Serves 12-20 SALE PRICE! 28" Carbon Steel Paella Pan (70 cm) Serves 15-35 SALE PRICE!